February Policy #6: Read. A lot. 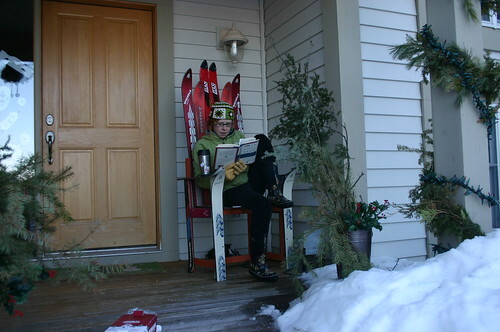 Perhaps more than anything else that winter brings– the serene stillness of the woods behind our house, the shush, shush, shush of cross country skis on a freshly cut trail, the red cheeks and snow-covered hats of my children– I love the space it creates to sit back and read. Books that pile up in my “to read” list all summer (and fall, for that matter) get dusted off and poured through in this season that calls us to tuck in early, that is cold enough to force us to turn inward– even if one of the best places to read is outside, as I learned this year (thanks for that, Jeff). Watching Noah discover this natural rhythm of winter reading almost takes my breath away. Really, it does. He curls up nightly on the floor by a fire, or hides three book lights strategically around his bed to carry words into sleep with him. 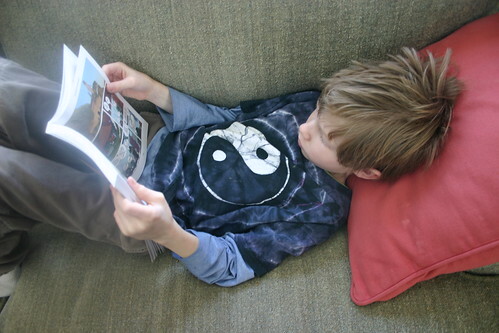 He gets up early, races to the couch after school, and sometimes just meanders through the house, his latest adventure or an old Calvin and Hobbes open in his hand. The extra sweet part of just letting yourself fall into a good book? 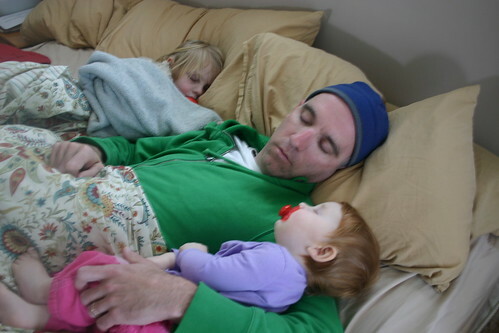 When you can cuddle up with your kids and read until you all fall asleep. Ah, now that, my friends, is heaven. Foreskins Lament by Shalom Auslander (don’t let the title freak you out– this is sooo funny). Skippy Jon Jones– because they are just as fun to read! Owl Moon by Jane Yolan (um, okay, I have read this to each of my kids since birth to ensure they grow to love it as much as I do). In the Harbor Springs/Petoskey area, we’re blessed with amazing independent book sellers…Find one in your area and you’ll never run out of great reads to lose yourself in this February. oh, darn, i just disconnected from the printer and now i have to reconnect for the book lists. i LOVE the image of noah learning the joy of reading. fantastic.